It’s good that the NFL is trying to make the game safer, but some would say that their efforts are bordering on over-legislation. 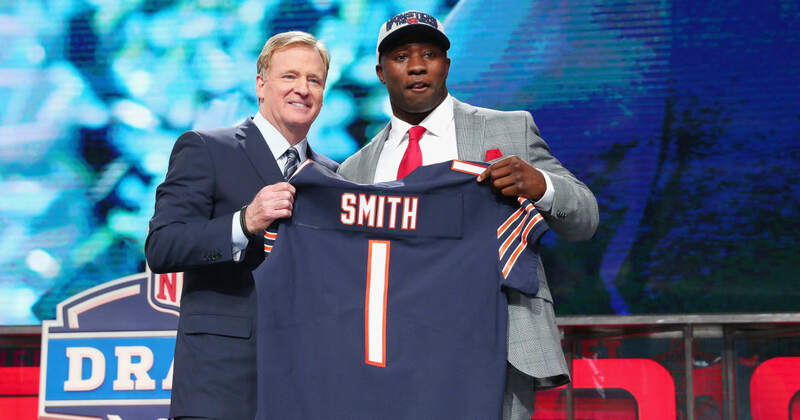 One of the latest changes is causing so much worry that it’s keeping one guy out of camp—Chicago Bears linebacker Roquan Smith. To be fair, it isn’t the rule that is keeping him out of camp. It’s the possibility that the guarantees in his contract could get voided if he gets suspended. “For both sides, it’s more of a language deal, a language-type deal,” new Bears head coach Matt Nagy said. The rule in question is a new one concerning players making contact with the top of their helmets. IN years past, it has resulted in a 15-yard penalty and usually a fine. But going forward, depending on the severity of the hit, it could result in a player getting ejected and/or suspended. It’s the type of thing that could happen more for one position than others. For an inside linebacker in a 3-4 defense, Smith will be in just such a position. He is going to be involved with a lot of hits and contact during games. His chances of committing a penalty, inadvertent or not, are going to be higher. Rather than risk his job security, aka guaranteed money, he wants language in his contract that will protect it. For some silly reason, the team has told him that it would be reasonable if he is suspended for a hit under the new policy. However, they are not willing to put any formal protection into writing. So, for now, the new lynchpin to the Bears defense continues to hold out. What’s the big deal? For both sides, it is pretty much about control. If the Bears retain the right to void his guaranteed money, they can cut him whenever they choose without taking a salary cap hit. For Smith, it is all about job security. The more money they owe him, the less likely they’ll be to let him go early. It’s like Smith and the Bears are forgetting that he was one of the best defenders in college football this past season. Do good players flop in the NFL? All the time. But should either side really want to be prepared in case he does? Or would it be more important to have confidence in a guy selected with the No. 8 pick? Shouldn’t the Bears be more worried about getting him into camp and teaching him the team’s defense? Or should they be concerned about making sure they can save some money if they need/want to cut him? The right answer is not hard to figure out. But does a real problem exist? According to the league, only three of 40,000 plays last season had hits falling under this new rule. Smith will be involved in more plays where the potential for such a hit exists. But it doesn’t sound like they happen all too often. Then again, if you don’t prepare for a rainy day, when one comes, you’re going to get all wet.